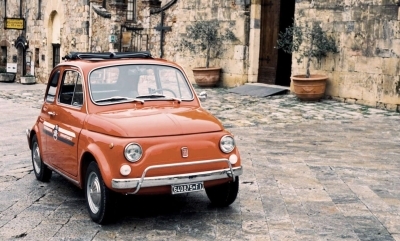 Explore the Chiantishire on Board of an Original restored Fiat 500. Visit a Chianti cellar and taste wine and typical local products. Live the breathtaking beauty of the Tuscan countryside on board of a vintage Fiat 500 during a scenic driving tour. Try to imagine how it would be to spend a day like the in the old Italian movies: driving a vintage FIAT 500 across the Chianti hills and enjoying all the beauty of Tuscany. Stop for a light lunch at a Chianti winery. Marvel at medieval villages in the rolling hills of the famous wine region, and more. Book the tour with Eurocasa Holiday and we will give you the opportunity to drive a fully renovated vintage FIAT 500 while a professional guide will be with you through the best paths and will organize stops in the most characteristic villages: you will discover the real Tuscany in these little gems that have remained the same through the centuries. Here you will have the opportunity to enjoy a typical Tuscan lunch and a wine tasting. Let us arrange an unforgettable day for you in Tuscany for the whole family! Schedule: Tour duration: 7 h and 30 min. Meeting point: centre of Siena or centre of Florence. •A valid driving licence is required to drive. You must take the licence with you the tour day otherwise you won’t be allowed to drive. • If you sign up as a driver you must be able to drive the car. In case your tour guide considers that you have insufficient driving skills, the company can cancel the reservation without any refund. • The tour will take place also with rain. In case the weather does not allow us to attend the tour due to heavy rain or wind, clients will be offered an alternative or a full refund. • A maximum of 4 people are allowed in a car. On request, we can arrange a private tour according to your needs.